An egg company in Galway has been granted an injunction restraining its former supplier from trading under a similar name, after the Court of Appeal found that the actions of its competitor constituted the tort of passing off. Overturning the High Court’s dismissal of the claim, Ms Justice Caroline Costello said that compliance with EU regulations on labelling the mode of farming did not entitle the competitors to appropriate the good will of the original company’s brand name or business. Galway Free Range Eggs Ltd was incorporated in 1994, and its eggs were marketed primarily in Galway and the West of Ireland. Until 2012, Kevin O’Brien and Carmel O’Brien supplied eggs to Galway Free Range Eggs which were produced at their farm at Hillsbrook, Tuam, County Galway. In December 2011, the O’Briens incorporated Hillsbrook Eggs Limited, and commenced producing, selling and marketing eggs under the brand name “Free Range Eggs Galway”. Mr Kevin Towey, one of the shareholders and a director of Galway Free Range Eggs, met with Mr O’Brien to protest about the O’Briens trading under their chosen name. Thereafter, the O’Briens ceased marketing their eggs as “Free Range Eggs Galway”, and began marketing their eggs, primarily in County Galway, as “O’Briens of Galway Free Range Eggs”. Galway Free Range Eggs objected to the O’Briens trading and applied for an interlocutory injunction to restrain them from marketing their eggs under the name O’Briens of Galway Free Range Eggs. Whether damage to the claimants’ goodwill or reputation by virtue of any such confusion has been established. However, Galway Free Range Eggs argued that Mr Justice O’Connor had failed to apply the test correctly. Misconstrued the regulations requiring eggs to be marked “free range eggs”, “barn eggs”, or “eggs from caged hens”; that there was no requirement for this label to be included in the brand name of the products, and therefore it was not required by law to adopt a brand name with the words “free range eggs” in its name. Galway Free Range Eggs said that this error led Mr Justice O’Connor to reduce the claim to the word “Galway”, on the basis that the company could not have an exclusive right to the words “Free Range Eggs”. In the Court of Appeal, Ms Justice Costello said that Galway Free Range Eggs established that it had a reputation or goodwill in the brand name, and also that it had a significant one. Stating that this evidence was uncontroverted, Ms Justice Costello said it was clear the first limb of the triple test had been satisfied and therefore the trial judge had erred in his finding to the contrary. 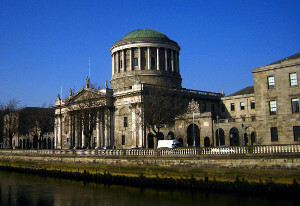 Ms Justice Costello also said that the correct test to be applied when considering infringement of a claimant’s reputation or goodwill in a brand name, was the likelihood that the public “would get an impression of a connection between the business of the appellant and the business of the respondents”. Finding that Mr Justice O’Connor had erred in failing to apply this test, Ms Justice Costello said it was not sufficient for the court simply to find that Galway Free Range Eggs had failed to establish misrepresentation leading to confusion between the egg boxes of the parties (i.e. the “get up” of the product). Further, Ms Justice Costello found that Mr Justice O’Connor was in error in failing to recognise the limitation of the legal requirement to mark the packaging in accordance with regulations (regarding the mode of farming). As such, Galway Free Range Eggs was entitled to claim a reputation and goodwill in the phrase “Galway Free Range Eggs” and in the combination of the words “Galway” and “free range eggs” – not confined to the use of the word “Galway”. Finally, Ms Justice Costello said that Galway Free Range Eggs had established that the O’Briens’ actions constituted the tort of passing off – therefore it was entitled to an injunction to protect the reputation and goodwill in its brand name on a quia timet basis, as it was not a requirement to show actual damage to succeed. Allowing the appeal, Ms Justice Costello held that Galway Free Range Eggs was entitled to an injunction to restrain the respondents from trading under the name “O’Briens of Galway Free Range Eggs”.